To Visit This Restaurant Please Select the Golden Button to the Left "Get Name/Address. "​Welcome to a truly Custom Brewed Coffee House where you're not just another number but your drinks are hand crafted the way you want them with the finest Coffees. Coffee customers are some of the most loyal customers around, once you become THEIR coffee place they are there almost EVERYDAY!! and sometime a few visits per day. A little over 8 years ago the founders relocated to the Antelope Valley to be closer to family. Here they reestablished a COFFEE House with all the fun filled aspects of a fun community gathering place. With live Acoustic Bands performing, a play area for the kids to enjoy as you sip a fine coffee drink and visit with friends. There is a big Game Shelf with many games to choose from to just relax and enjoy time with family or friends or make a new friend with a little friendly competition. Free WiFi is offered for students wanting a place to hang and do homework and the business person needing to connect to the web. The Owners know they've grown a little stagnant and have lost their hunger and drive that a New Owner brings to connect with the millennials and grow the business. Owners Stated Sales have been ranging in the $13K per month area, SellingRestaurants has not verified these numbers and Buyers should do a thorough due diligence. AND ALL YOU NEED TO GET STARTED IS $49,000...this gets it all...But Owners are willing to train a buyer in formulas, recipes, equipment functioning and care. They will get you connected with local talent for nights you have live music. Owners are willing to share all they know about coffee and the operation of this business. This will be included in the price of business. Besides Coffee their menu includes Bakery Items, Sandwiches, Wraps, Fruit Smoothies, Salads, Ice Cream and more. This could just be the place you have been looking for that has an established business base and with some fresh ideas and excitement you can build on that and turn this operation back into a thriving profitable business. 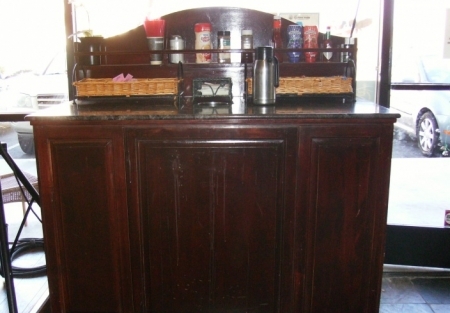 Please visit us at www.sellingrestaurants.com to get the name and location of this business.